World No Tobacco Day (WNTD) is observed around the world every year on May 31. It is meant to encourage a 24-hour period of abstinence from all forms of tobacco consumption across the globe. The day is further intended to draw global attention to the widespread prevalence of tobacco use and to negative health effects, which currently lead to 5.4 million deaths worldwide annually. The member states of the World Health Organization (WHO) created World No Tobacco Day in 1987. In the past twenty years, the day has been met with both enthusiasm and resistance across the globe from governments, public health organizations, smokers, growers, and the tobacco industry. However, this year the health message of No Tobacco Day was probably overshadowed by the WHO's troubling press release about cellphones possibly causing cancer. But back to tobacco. Because reading about No Tobacco Day made me think about when smoking was still allowed on airplanes. It seems like an eternity since anyone was allowed to light up on-board, but I'm definitely old enough to remember those days. For example, I remember sitting on a trans-Atlantic flight in the early 1990s, just behind the curtain separating the smokers from the non-smokers, gagging because of someone puffing on a cigar right in front of me. It wasn't that long ago, but today, that kind of thing seems unthinkable. 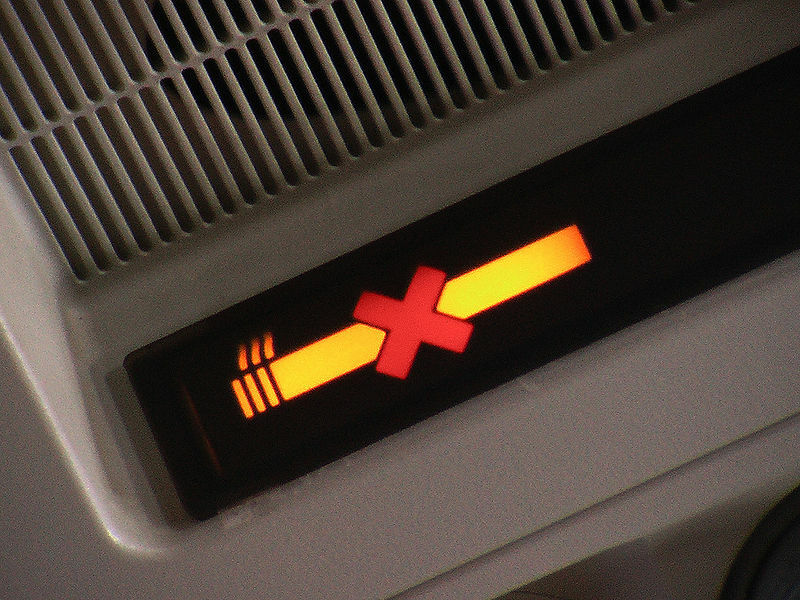 In the United States, domestic non-smoking flights started happening in 1988, but it wasn't until the later 1990s that smoking was banned on more and more long-haul flights. As late as 2002, an airplane passenger died from an asthma attack triggered by second-hand smoke on a flight. His widow sued the airline and was awarded 1.4 million dollars. I figure that kind of tragedy, and all the new security regulations related to 9/11, was the final nail in the coffin for smoking on board. It is actually interesting how quickly the tide has turned when it comes to smoking on airplanes. I can barely even imagine what it would be like to go on a flight with my children and have them be subjected to someone's cigarette smoke. I know the smell would drive both of them nuts: they wrinkle up their noses even if we just pass someone on the street who is smoking. Air-travel has undergone major changes in the last decades, and not all of them have been enjoyable. There's the reduced leg-room on many flights, and the lack of free meals on many carriers. There's all the rules for liquids that have to be in this size containers, and then stuffed into this kind of ziploc bag. There's the fact that me and the kids have to take our jackets and shoes and belts off at so many security checkpoints and that screeners often manually search our hand luggage. There's the hassle of having to show my own and my kids' passports eleventy-seven times before we get on the plane. But the smoking ban on almost every flight and every carrier is a glorious development. My kids don't have to sit behind a thin curtain, gagging on second-hand smoke on a flight. That's worth a lot. Traveling with kids can be a challenge, but at least, these days, it's a smoke-free challenge. World No Tobacco Day sign thanks to WHO, "No smoking" sign thanks to Kashif Mardani, via Wikimedia Commons.